Although the following terms and conditions are available in various languages for the benefit of our clients, the original English version will always be considered as the reference. The gîtes, and designated grounds and facilities, known collectively as Les Séchoirs – are offered for rental subject to agreement between the renter (the guests) and the owners – John and Chrissie Stephen. Bed and Breakfast (low season) rentals: Earliest check-in 16:00 check-out is between 07:00 and 10.00 on the day of departure. Vacation rentals : Saturday to Saturday, although some flexibility may be available, particularly out of peak season. Earliest check-in is 16.00; check-out is between 07:00 and 10.00 on the day of departure, unless otherwise agreed in advance. Latest check-in is 22.00. Please signal to the owners your expected arrival time and/or any delay via email or SMS Text message because the gates to the property may be locked at night. Unless otherwise stated at the time of booking, payment is in Euros and should be made by electronic bank transfer in Euros. The price quoted for the rental period is for the number and names of guests specified by the renter at the time of booking, subject to the maximum stipulated by the owners for the gîte in question. No extra guests are permitted to either stay in the gîtes or use any of the shared facilities of Les Séchoirs without the specific pre-authorization from the owners where a fee may be charged at the owners’ discretion. Friends / relatives of the guests at Les Séchoirs may visit but may only use the private accommodation of the respective guests’ gîte. Except for fishermen wishing to fish at night, and hence using a tent near the second fishing pontoon, no camping is permitted under any circumstances.See below for policies relating to fishing. Guests are free to bring their own linen, but no reduction in the charge is applicable. Please notify us if you wish to bring your own linen. The rental payment is inclusive of water, electricity, gas, Wi-Fi, pillows, towels and a single set of bed linen and towels per person per week. Charcoal and lighter fuel for the BarBQ is not included. A supplementary charge of €10.00 per night/day for heating (electricity and/or wood) usage will usually be levied for low season rentals (October through April inclusive). Use of the laundry is available to all guests but a contribution of €6 (day) and €4 (night) per wash is made to contribute towards the costs. The rental payment is exclusive of the Taxe de Séjour which is a French government tax levied on all adults, age 18 and over staying in hotels and / or rental properties. The charge is currently €1.20 per adult per night. 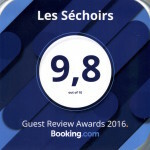 The tax should be paid to the owners, at the end of your stay at Les Séchoirs. Internet access is available throughout the Les Séchoirs property. There are no restrictions for reasonable usage but temporary outages can occur form time to time. Such occurrences are not in the control of the owners who will endeavour to restore availability as soon as possible. Guests should complete and return the booking form together with a 25% deposit. Following receipt, the owners will send a confirmation notice by email (or letter if required). This constitutes a formal agreement between the guests and the owners. Provisional bookings will be held for up to five (bank) working days to allow for receipt of the 25% deposit. Receipt of the reservation deposit and / or full fees implies full acceptance and compliance with these terms and conditions. The balance, together with the security deposit (see below) is due six weeks before the start of the rental period. In the event of late receipt of payment, the owners reserve the right to cancel the booking, retain the deposit, and re-let the property. Any such cancellation will be advised in writing. Bookings made within eight weeks of the start of the rental period must be paid in full at the time of booking. A €300 security / damage deposit for each gîte should be added to the balance payable 6 weeks prior to the start of the rental period. The security deposit will be refunded as soon as possible after your departure subject to possible deductions for damage, breakages, or additional cleaning (see below). This will be by electronic funds transfer in Euros. Bookings are confirmed on the understanding that the accommodation booked will be available for the dates specified. However, if this is no longer possible, due to circumstances beyond the owners’ reasonable control, a prompt and full refund of all monies paid will be made, but there can be no further claim made against the owners for whatever reason. In the event of the booking being cancelled or altered by the renter by reason of force majeure which includes floods, storms, riots, strikes, wars, and anything else beyond the reasonable control of the owners, the owners cannot accept responsibility or liability. If the renter or any other person in the guest party falls ill whilst at Les Séchoirs, or for any other reason, has to depart early, the owners cannot be held responsible for any additional costs incurred, nor can any part of the rental fees be refunded. more than 8 (eight) weeks before rental period begins, the deposit paid is non-refundable. less than 2 (two) weeks before rental period begins, no refund of rental costs will be made but the security deposit will be refunded in full less any associated bank and / or transfer fees. If, however, it becomes possible to re-let the gîte(s) for the same dates, after a cancellation, a full refund less a €100 administration fee less any associated bank and / or transfer fees will be made. ALL guests should have appropriate travel insurance including personal liability. The owners can bear no responsibility for travel or associated costs incurred by guests. Use of the accommodation and all amenities is entirely at the guests’ own risk. Guests’ personal belongings (including motor vehicles) left in, or around the property, are entirely at guests’ own risk, and no responsibility can be accepted by the owners for loss or damage thereto. Whereas the swimming pool complies with the appropriate regulations to help prevent unsupervised child entry, the owners take no responsibility for the safety of guests and indeed they caution that the property is on the banks of a deep, flowing, river (the river Lot) to which there is direct access at all times. All children should therefore wear suitable high visibility buoyancy jackets and be supervised at all times; especially in and around the pool and riverside. Guests agree to take all precautions necessary to ensure the safety of members of their party and to avoid all potentially dangerous activities within the property. Guests are responsible for ensuring that their minors are supervised at all times. Please respect and show consideration for your surroundings and your neighbours. We respectfully ask that no loud noises are made or that music is openly played and certainly not after 22:00. Please report ALL breakages as soon as possible. A charge is not always levied, but the owners would rather talk to the guests than discover breakage or damage after departure. Gites will have been thoroughly cleaned with beds made and all items checked. Guests are expected to vacate the gîte in the same state of order and cleanliness in which they found it. If, for any reason, you are unable or do not wish to do this, then a charge of €75 will be made. Please alert the owners in good time of this as provision will need to be made. Guests agree to be considerate tenants, take good care of the property and its facilities, and leave it as they found it upon arrival. The owners reserve the right to make a deduction from the security deposit to pay for any breakages or damage. Any guest/guests deemed to be acting in a consistently unreasonable manner will be asked to leave Les Séchoirs. Whilst every effort has been made to ensure that the description of the property and nearby facilities is as accurate as possible, the owners cannot accept any responsibility or liability for changes beyond their control. Should you have a complaint about any aspect of your stay, please report it to the owners as soon as possible so that they have the opportunity to deal with it promptly; problems cannot be resolved after guests have departed. No glasses (including bottles) or metal cans, sharp objects are allowed within the swimming pool area. Plastic tumblers and wine glasses are available within each gîte for use in outside areas. Smoking is not permitted in the gîtes or in any of the enclosed wooden areas. Any contravention of this will result in immediate forfeit of a guest’s security deposit. Cigarette ends should be disposed of thoughtfully and not dropped in the grounds nor in the river. Ash trays are provided in both communal and private outside seating areas. All waste and rubbish should be disposed of promptly and carefully; separate rubbish bins (clearly marked for recyclable and other rubbish) should be used frequently – especially in summer months! Separate towels are provided for use outside around the swimming pool. No linen or towels are to be taken off the property (or in the rowing boats) at any time. The completed and transmitted booking form indicates agreement to comply with and acceptance of, all the above terms and conditions. Guests who wish to fish in the river Lot, including from the fishing pontoons at Les Séchoirs and / or the fishing boats agree to purchase a fishing licence and abide by, and adhere to, the rules and regulations as required by Fédération Nationale Pêche. In particular we operate a No Kill policy and only barbless hooks are recommended. Guests should bring all fishing equipment as none is available for hire from the owners. Night fishing is permitted from May 1st but fishermen are requested to only used the second (farthermost) fishing pontoon to ensure that guests wishing to sleep, may do so! Fishermen’s tents / bivvies may only be erected around the second fishing pontoon. However, the public footpath must remain passable. Any request to bring pets must be requested at the time of booking. Pets belonging to guests are only permitted, with prior notice, in Les Tabacs gîte, as this has an enclosed, private garden. To cover the additional cleaning / cleansing required, a charge of €5 will be made for each pet per day. Owners of the pet(s) will be asked to pay a (refundable) deposit €100 to cover damage and / or the clearing of paths and lawns of dog poo (excrement). If a security deposit of €300 has already been paid, then no additional security deposit will be requested. Dog poo (excrement) should ALWAYS be collected by the dog’s owners and disposed of in the BLACK (communal) rubbish bin. Dogs must NEVER be permitted to use the beds and furniture of the gîte. When not within the enclosed (private) area of Les Tabacs gîte, dogs should be on a leash at all times. Dogs should not be taken within the swimming pool enclosure as this risks fowling the area and the possibility of dogs swimming in the pool! The owners reserve the right to refuse entry to any pet that is deemed to be too large and / or likely to cause disruption. It is therefore important for guests to be sure that they are able to comply with these requirements.